Braces can be an excellent way to help straighten your teeth, and achieve a great smile. But, how do braces work anyway? Braces can be dated back to ancient times. In fact, archaeologists have found the mummified remains of people with metal bands stretch across their teeth. Even Cleopatra was known to have worn a type of dental aligners. Braces work by applying constant pressure to the teeth, which over time, will move the teeth to their desired position. As the tooth loosens to move to the new position, new bone will actually grow to support the tooth in its altered position. Today, there are different types of aligners, but we will look at the two most common. Traditional wired metal – These aligners are stainless steel, and sometimes a combination of titanium is used. This traditional method is still the most common. These implement a metal bracket with rubber band ties that hold the wire on to the metal brackets. This method will require more frequent adjustments and cause a bit more tooth discomfort. 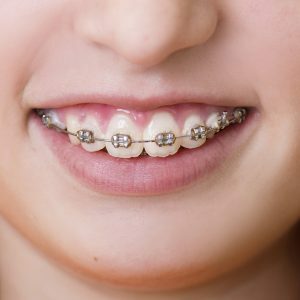 Another method is self-aligning braces, which do not require the use of rubber bands, as the wire itself will go through the bracket. This method involves less discomfort and fewer adjustments are needed as with the first method. Clear – This system involves clear, plastic aligners that are worn over the teeth to gently direct them into the desired position. Photographs, x-rays, and dental impressions are sent to a lab, where the aligners will be produced. With clear braces, you can remove them whenever you eat, brush, and floss. Since they are virtually invisible, most people will be unaware you have them. These will decrease dentist appointments and your discomfort level! As always, if you have questions regarding tooth alignment, or are looking for a dentist in the Edmond area, please contact Dr. Gray’s office to schedule an appointment!